201 p., 14,8 x 20,5 cm. With contributions by Malcom Acock, Victor H. Dudman, Howard Jackson, Leonard Linsky, Richard M. Martin, Michael D. Resnik, David S. Shwayder, Fred Sommers and Ernst Tugendhat. 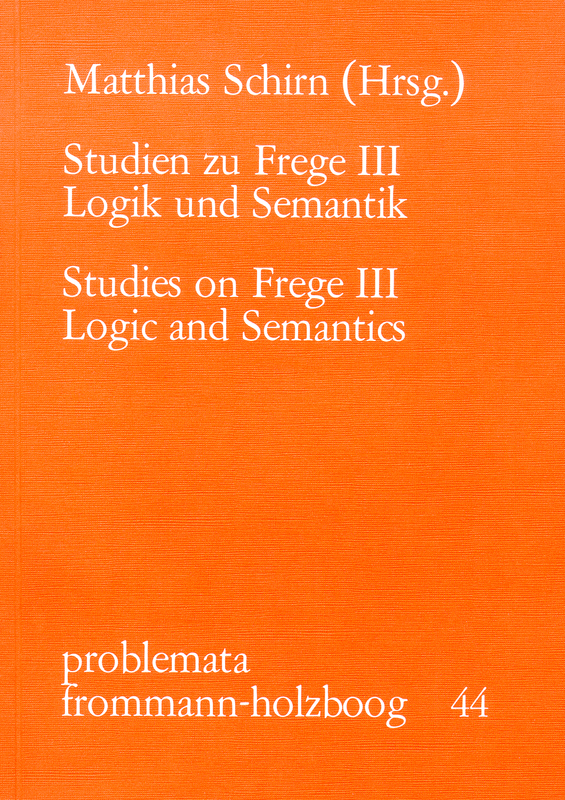 The present collection of articles, mainly consisting of new publications, is a critical appreciation of the work of the logician, mathematician and philosopher Gottlob Frege. – Volume III chiefly contains studies on Frege’s theory of sense and reference, generally regarded as the beginning of modern extensional and intensional semantics. Included is an attempt to provide a uniform explanation of the concept »Bedeutung« and to delimit the scope of the context principle in Frege’s philosophy. Further articles deal with special problems of the theory of sense and reference. Fred Sommers: Frege or Leibniz?